After spending the last few months of 2016 in a prestigious residency programme won through the Royal Drawing School and IIFA (International Institute of Fine Arts), four British artists are now displaying their work at Daniel Raphael Gallery in Marylebone, London on 20th June to 10th July. 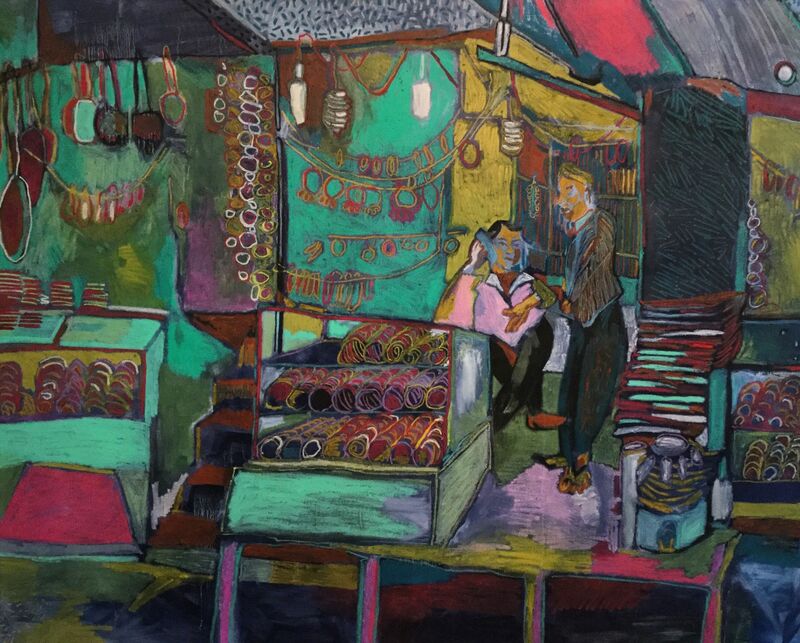 Artists Christabel Forbes, Lottie Stoddart, Tyga Helme and Matthew Cunningham were all selected by the 2016 panel and will be displaying work created during their time spent in the town of Modinagar, a small Indian village near New Delhi. As part of their residency, the four artists spent a portion of their time teaching their craft to students at the Modinagar University, in between extended independent exploration and drawing sessions. The work is strikingly colourful, using turmeric as a base coat for much of the paintings which give the pieces a somewhat otherworldly, evocative glow. It was this inclusion of the spice in the works, and the cultural links associated with it, that led to the show’s title, Turmeric. Finest Jewellers of Old Delhi by Christabel Forbes presents a vivid street scene, in which the heat and buzzing culture of the market town comes to life on the canvas, deep shades and busy lines forming to create a work that expresses the very vibrancy which fascinated the artists during their time in India; the turmeric base coat helping to create colour that seems to leap off the canvas. Similarly, Tyga Helme’s work evokes the dynamic atmosphere of India with loose forms doused in rich tones, palm fronds swaying into frame and hazy figures shimmering on the edge of focus. 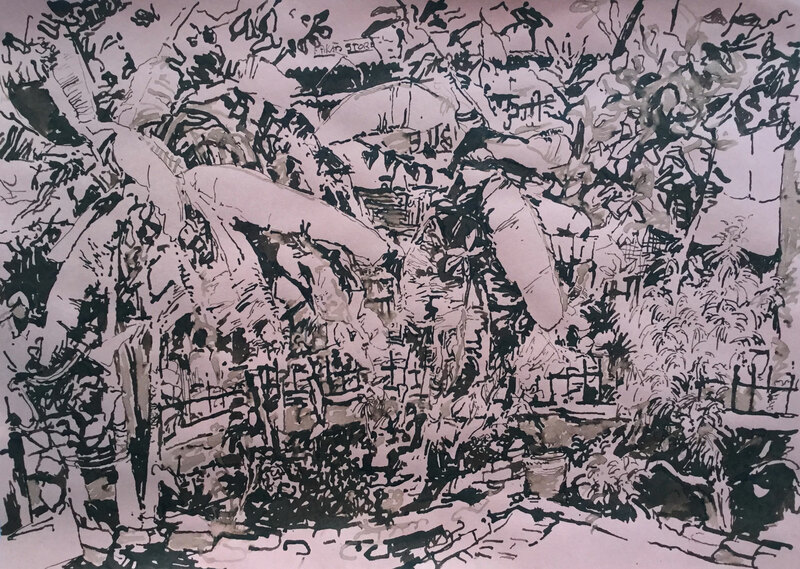 Lottie Stoddart has created several painting and sculptural pieces for the show alongside her work on canvas and will be returning to the area in September as next year’s residency ambassador. 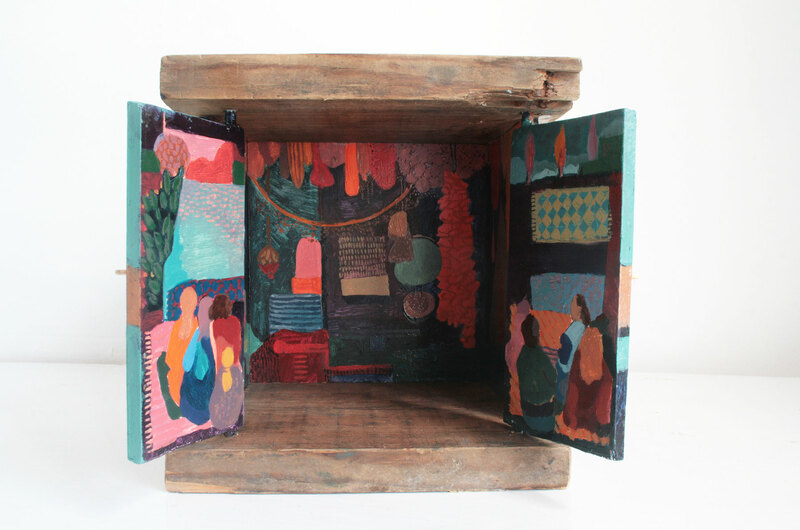 Her sculptural piece Shrine 1 is painted inside a beautifully crafted reclaimed box that opens onto a colourful market scene, laden with hanging objects that draw the viewer in, inviting and warm as the residency turned out to be. Continuing her work with thematic elements from their time in India, Stoddart expressed her feelings of the time spent there in a way that mirrors one of the key ideas behind the show: “It never leaves you”. Funded by the Modi Foundation, founded by Satish and Abha Modi, which set up the International Institute of Fine Arts (IIFA), artists on the residency stayed in the ancestral home of the Modi family, creating work both directly on the streets and in-house studios as well as spending ten days developing their practice at Sanskriti Kendra, a cultural hub in South Delhi. The Modi residency reflects the best of a long history of Anglo-Indian cross culture, providing exciting opportunities not only for students on the residency but also for students in Modinagar who work closely with the artist-students from the Royal Drawing School. The residency, the most sought after at the Royal Drawing School, boasts a selection group of unnamed high-profile art A-listers who judge candidates on previous work and a portfolio on top of previous artistic teaching experience. The show complements the British Council’s UK/India 2017 Year of Culture, a major year of cultural exchange between the two countries in 2017.